The wind never let up overnight. Strong north westerlies and unusually warm. The other guys were well and truly asleep when I rose so I grab my gear and headed outside the hut to cook up breakfast and coffee without making a disturbance inside. The sand flies were vicious and I had to pull on my shell pants to stave off the assault while the billy boiled and I got packed up. From Top Timaru Hut the dozer track continued for around a kilometre before it was back into familiar country. Into the Beech Forest following sidle tracks. Once in the shelter of the trees the wind was less noticeable. The track condition was the usual tramping standard. The sidle, out-sloped and picking its way between rock and roots, with some steep drop offs. I think after so much walking on this type of track that you get used to the exposed drop offs, to the point where you don’t really think about them any longer, crossing them just the same as you would flat ground without paying too much attention to big falls below. It was great to be under the shade of the trees again and sheltered somewhat from the sun. 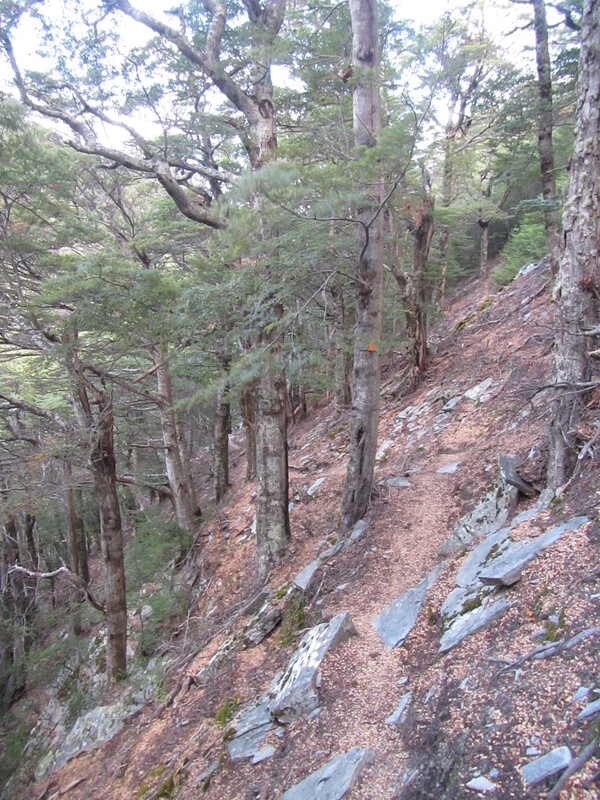 From first entering the forest the trail followed the Timaru River for 9 kilometres. Steep sidles, lots of ups and downs various spur lines running down to the river and climbing up and around rock features too tricky to negotiate on the river itself. I didn’t count them but there were around a half dozen crossings of the river itself. It was running a milky colour, indicating possible rain higher up in the catchment, but all easy negotiated. The deepest crossing was just over my knees and the current wasnt very strong. It was crazy. Straight up for the first 20 minutes. In sections not even anything for shoes to grip other than making sure your feet were level with the ground to get as much rubber on dirt as you could. Talk about straining on the calfs. Once rocks started to appear it became easier as these could at least be used as steps. And once onto the actual spine of the spur the going got easier. 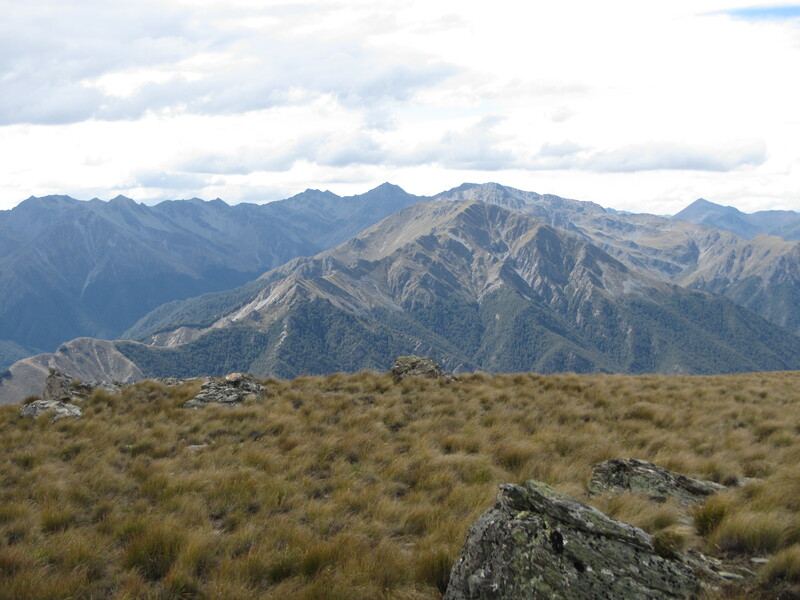 Still, it was a hard slog up and up and up, for about an hour before the ground levelled off just near Stodys Hut. I stopped in at Stodys for lunch. I didnt think much of the hut. A very old and run down place but I’m sure would be welcome relief in the rain. DOC don’t think much of it either and consider it to be a Basic Hut, free of charge to use. The toughest walking was out the way and the rest of the day was on old 4wd tracks from Stodys Hut right through to the top of Breast Hill. The track was high up above the tree line, through a farming station. Wide open views abounded and offered a sneak peak of Lake Hawea. The wind was fierce up high, smashing into me and trying to knock me off my feet or blow my sideways. It tried to take my hat a couple of times and eventually had to stow it before I lost it. 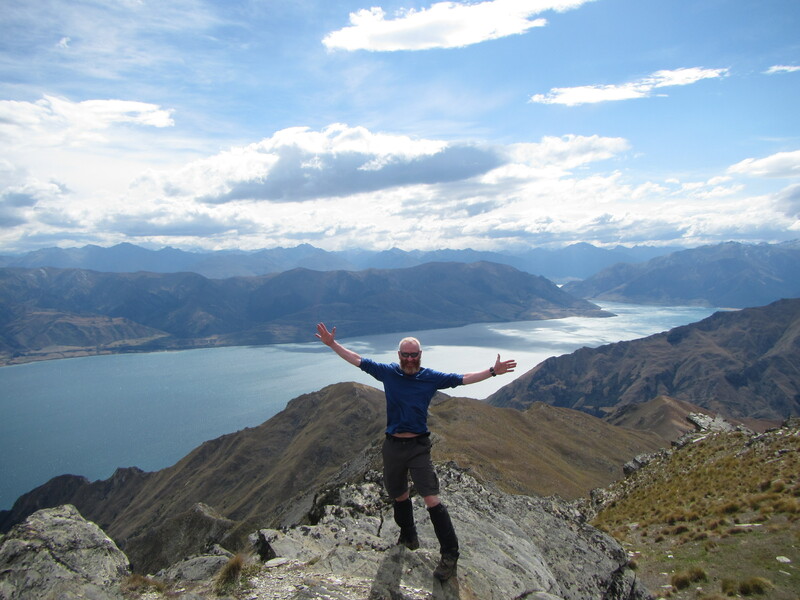 It was a quick 8.5km on the old track to the top of Breast Hill to be met with spectacular views down below to Lake Hawea and the surrounding peaks. The winds were still up and it was hard to get decent photos as the wind knocked the camera around. Arriving at the summit at the same time from the opposite direction was a French couple moving north bound. We took the opportunity to take photos of each other. Leaving the summit views it was an easy last couple of kilometres along the top of th escarpment to descend a little to Pakituhi Hut, the trail moving through stunted alpine grasses. I had to fight the wind the whole way down as it funnelled up each gully to rip over the top of the escarpment, knocking me about. At least it was pushing the right way, battering me towards land and not into the void below. On reaching the hut I met Will and Tyler from the states, both headed northbound. I’m meeting more and more north bounders every day now but unfortunately you don’t really get to know them as you those heading south as you only spending a single night together before moving on. They were great to meet. Young guys, living the dream and escaping the 9 to 5 world by taking their time on the TA. We shared music together on a small speaker that they had, shared some chocolate, coffee and great conversation. I miss playing drums and making music. I’ve found myself on a couple of occasions tapping my walking poles in time to rhythms playing through my head phones. Wonderful description. Great work. How many pics have you taken so far? More than enough to share a night out with friends. Yesterday read an article about a lone woman trekker travelling the world. She says she feels at one in the wilderness and desserts. That was in a magazine called wild.